Thats easy peasy ! : CHRISTMAS PREP - Xmas cake & pudding. CHRISTMAS PREP - Xmas cake & pudding. Time is flying by! I was only preparing Halloween treats and a party and taking down decorations like ‘yesterday’. Now I’m thinking Christmas. And rightly so as all you foodies will know……Christmas cakes and puddings take their time but done correctly will be moist and yummy! I pick up bits and pieces throughout the whole year for Christmas. Whenever I see something cool or reasonable I think “who would love that for Christmas” or “wouldn’t that be nice for Christmas”. It takes the pressure off both my pocket and my brain when Christmas comes around. Then once Halloween is over I then start picking up food stuff and more bits and pieces every week. I was tempted over the Halloween in certain shops…….on one side was Halloween stuff and on the other Christmas! But I refrained and stopped myself and told myself “after Halloween, after Halloween”! So here I am now, into the 2nd week of November and thinking about Christmas prep. I baked some yummy BROWNIES (recipe on separate post) and as I dusted them with icing sugar I thought they looked quite festive. That got me thinking of Christmas cooking. I took out my cooking and prep notes and had a little read. It seems only like yesterday I was doing it for last year! So now ladies (& gents) we concentrate on PLUMPING FRUIT and getting our CHRISTMAS CAKE ready and baked so that we can feed it regularly with booze. It can be fed for anywhere from 2 -12 weeks! I usually tend to do it for about 3-4 weeks. My cake recipe requires 9inch round or 8inch square tin. Again, once you have these spices bought in and stored you will have them for the next time. The cake is a long slow cooking process but guarantees a yummy moist Christmas cake at the end of it. You may not have the patience to prepare, bake and mature a Christmas cake but I promise it’s rewarding and tastes so yummy come Christmas time. Not to mention the amazing aromas that will engulf your house. When I was growing up, my father used to make dozens of these over the weeks leading up to Christmas. I remember thinking he must have being feeding a nation with the amount he made. Some of the cakes went to work with him, some given to relations and the remainder were left for us to devour at home! I remember how we were warned to be so quite coming and going because if we were to bang a door, the cake would flop. I remember being oh so careful opening and closing the doors and sometimes I wouldn’t dare leave a room in case I was the culprit to flop the Christmas cake! But I also remember the amazing smell and aroma around the house. That is Christmas memories for me. I know it seems like a lot of reading and effort but I promise it’s not that difficult. It’s so rewarding come Christmas time when you have a beautiful tasty and moist cake to show off. If you would not use up all of the cake, you could cut it up, nicely decorate it, wrap it up and give it to family around the festive season. My advice is to read through this first and then again before making it to familiarise yourself with it. Also, have all your ingredients measured and ready along with the tools you will need. And most important to have your dried fruit soaked the night before. You can use either sherry or brandy. My choice is brandy. And remember…it should be fun and exciting preparing it. Don’t forget to write down your fruit ingredients you will need on your shopping list and have them bought in for when you want to prepare you fruit. You will be baking your cake the following day. TIP: Write down all the ingredients from this recipe onto a sheet of paper so you will have it when you are shopping next. Place them in a bowl and mix with 3tbsp brandy. Cover with a clean tea towel and leave to soak overnight/12hrs to absorb the alcohol and plump up. This step is also very important too. 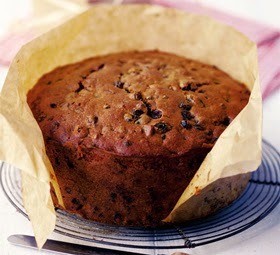 It is important to line the tin well for a good moist cake…..it will prevent over browning and dried out edges and base. It will protect it from the heat of the oven. 1. Measure length and width of tin. Add twice to its depth. Cut parchment/greaseproof paper. Place the tin down on the centre of the paper to measure. Cut 4 cuts from the edge of the paper to the corners of the tin. 2. Grease the tin base and sides with oil/butter. Fit down your prepared parchment paper into base, folding and overlapping it at the corners. 3. Cut another piece of parchment paper the size of just the base and place into the base. 4. Brown paper is then tied around the outside to the same height as your parchment to protect the cake during the long, slow cooking process. 5. When you spoon your cake mix into tin, place a double layer of parchment on top with a 50c sized hole in the centre. Make sure it fits on the top of the cake and NOT on the rim of the brown paper. 2. Cut a strip of parchment slightly longer than the circumference of the tin. Make sure its 3 inches higher than tin also. Fold it back about 1 inch along its length, then snip it at an angle at intervals up to the fold. 3. Press paper around sides (snipped edge will overlap on the base of tin for snug fit). Finally, cut a circle out (use tin as a template) to fit over the snipped paper over the base. 1. Preheat oven to 140°’C. 2. Sieve 12oz flour with ½ - 1 tsp mixed spice in a bowl. 3. In your mixer, cream together 8oz butter; 8oz moist brown sugar and 1 level tbsp golden syrup. 4. In a separate bowl whisk 4 eggs with 4 tbsp brandy. Gradually beat this into your butter mix. If curdling appears, add a little of the sieved flour. 5. Fold in the flour mix with a METAL SPOON and then add the prepared soaked fruit mix along with 2-4oz chopped glace cherries; 2-4oz chopped mixed peel; 2-4oz chopped blanched almonds (optional) and the zest of 1 lemon and 1 orange. Make sure everything is well and truly combined. You may need to transfer to a larger mixing bowl for more room to work. 6. Put your mixture into your prepared tin; flatten the top and tie the brown paper around the outside of the tin with some twine. 7. Fix your prepared ‘50c’ parchment now as outlined above. 8. Paying attention to the temperature of the oven is also another extremely important step. Bake your cake on the lowest shelf of the oven for 4 HOURS until it feels springy in the centre. DO NOT LOOK AT IT FOR 4 HOURS…DO NOT OPEN THE DOOR AT ALL! If it needs a further 30-40 mins after the 4 hours then so be it. 9. Cool the cake for 30 mins in the tin then transfer it to a wire rack to finish cooling. 10. When it’s cooled make small holes in the top and bottom of the cake with a cocktail stick and spoon in a couple of tablespoons of brandy. 11. Wrap the cake firstly with parchment paper and then in tin foil. Remember you will be feeding this cake with Brandy so make it easy to get at and open. But you must store it in an airtight tin or make sure it is thoroughly sealed. 12. Continue to feed your cake with brandy at intervals until you are ready to eat or ice it. ICING your Christmas cake is a really festive and lovely touch. It is simple to do and is great to show off to family and friends. You can buy ready made icing to roll out which is perfectly acceptable and probably the easiest option. You can also opt for MARZIPAN if you prefer. Getting the consistency of your icing takes patience but when done it looks and tastes great. So, you’ve made your cake and fed it for a couple of weeks now. Now it’s ready to be iced. The Christmas cake is lined firstly with an ALMOND ICING and then with ROYAL ICING. 3. Add enough liquid to the dry ingredients to get a firm paste. 4. Knead well together to make a smooth paste. 5. Apply to top and sides of your cake and allow to set before covering with royal icing. 2. Put 3-4 egg whites in a bowl; add the icing sugar slowly, beating well with a wooden spoon or in a mixer. 3. Beat in 2tsp lemon juice. 4. Using a pallet knife layer the cake, peaking it at the ends for a snowy iced effect. Alternatively you can smooth it down for a nice smooth effect. And leave to set. 5. You may then decorate your cake with whatever ribbons and toppers you fancy. Again, you will need to start the night before with soaking. Your pudding does not need as long as your Christmas cake to mature. However, it will take around 6 hours to slowly cook. The smells in your kitchen and house will be amazing though and definitely set the Christmas spirit. Again, I would advise you to write all your ingredients down for your shopping list and read through the method first to familiarise yourself. 2. Grease a 2 ½ pt pudding bowl and place the mix into this. Cover with a double layer of greaseproof paper, leaving a pleated fold in the centre to ensure pudding can expand slightly. 3. Then cover with a layer of tin foil and tie securely with a sting to prevent any water or steam from entering the pudding. 4. Half fill a large saucepan with water and bring to the boil. On a very low heat place the pudding into the water, cover and steam for about 6 hours. I steam mine over the range stove. Check your water level frequently so it never boils dry. When cooked the pudding will have a beautiful deep brown colour. 5. Remove the pudding and allow to cool completely in its tin foil and paper. Then insert a skewer in the pudding and pour in a little brandy if you like for an extra hit! Cover again with Fresh greaseproof and retie. Store in a cool dry place until Christmas day. NOTE: The pudding must sit and mature otherwise it will collapse if eaten straight away. Allow to sit for a couple of weeks, perhaps 2 or 3 for the flavours to mature. It needs to be reheated then on Christmas day. 6. To reheat the pudding steam again for about an hour. · Pour 2-3tbsp brandy into a long handled metal ladle and heat over a flame or heat in a small saucepan first then transfer to the ladle. Get it nice and hot. · Tilt the ladle into the flame or light it with a match for the spirit to catch flame. Immediately pour over the pudding and bring to the table. 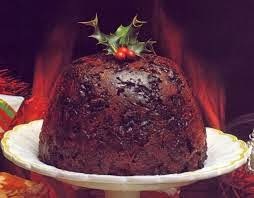 Last year my pudding went down a storm with my BRANDY BUTTER. 1. Cream together 50g butter with 100g sieved icing sugar. 2. Bit by bit blend in 2tbsp boiling water & 3tbsp brandy until smooth. 3. Chill until needed. This can be made a couple of days in advance and stored in the fridge. So, there you have it. Christmas baking in a nutshell. I hope you all have fun preparing for Christmas. If you have any tips or ideas please share with us. I would love to see all your pics also. 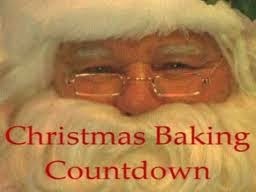 Keep up to date with all your Christmas baking and cooking tips and recipes here on my blog over the coming weeks. Lots more to come! HAVE FUN EASY PEASERS ! Why i bought RICE WINE VINEGAR & ALMOND OIL!